The findings of the employee and PhD student survey – with a slightly lower response rate than in 2013 – show that eight out of ten staff are satisfied with their workplace. But both PhD students and staff experience stress. This year’s employee survey is the sixth in a row. Only a few small adjustments were made to the 2013 survey, so it is easier to make comparisons and see differences. In total 77% of staff – 2,788 people – responded to the employee survey, and 63% – 738 people – to the PhD student survey. 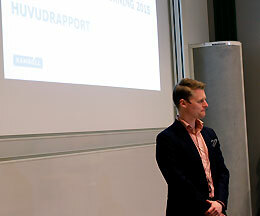 When Ramböll, the consultancy firm, presented the overall LiU findings they were able to state that this year, again, eight out of ten staff members think LiU is a good workplace. Only six per cent are not satisfied with their job. In particular, questions on immediate superiors and working conditions were rated highly. And these are very good results when compared with other workplaces, says Ramböll. The areas that scored lower in the survey were measures taken by the university and departments, and issues regarding strategies. Also cooperation inside and outside the respondent’s division scored lower. Stress is an area that stands out in the survey. Nearly two out of three say that stress affects their well-being more than rarely. Ramböll also sees potential for improvement as regards the follow up to the survey, even if that question actually scored quite highly. If we compare the changes in this year’s findings with 2013, we see that most of the changes are positive. If we look at the 12 questions where the greatest change occurred, eleven were more positive results this year, while only one was more negative. Hence most people appear to be reasonably satisfied in their work at LiU. When asked whether they were proud to work here, 77% said yes while only 6% put “completely disagree”. The same number, 77%, say they would recommend other people to apply for jobs at LiU. The scores in the PhD student survey are generally somewhat lower than in the staff survey. But more departments got higher scores from their PhD students; at the top are the Department of Culture and Communication, the Department of Mathematics and the Department of Thematic Studies. Supervision and individual study plans appear to be working well, says Ramböll. Supervision received many positive scores and appears to be crucial to how people experience their graduate education. Also, the service at the university library and from IT is appreciated by PhD students, receiving higher scores this year over 2013. On the other hand stress and negative discrimination are two clear challenges. A higher proportion of PhD students experienced stress, which impacts their well-being. And 15% of PhD students responded ‘yes’ to the question of whether they had experienced negative discrimination. The specific results for the departments and institutions will be distributed to the respective heads this week. The idea is that each division will work further with their survey results and develop action plans for improvement.